Product categories of Welding Machine, we are specialized manufacturers from China, Welding Machine, Tig Mig Welder suppliers/factory, wholesale high-quality products of Portable Welding Machine R & D and manufacturing, we have the perfect after-sales service and technical support. Look forward to your cooperation! We produce ARC welder, Mig Welder, MAG welder and Tig Welder. 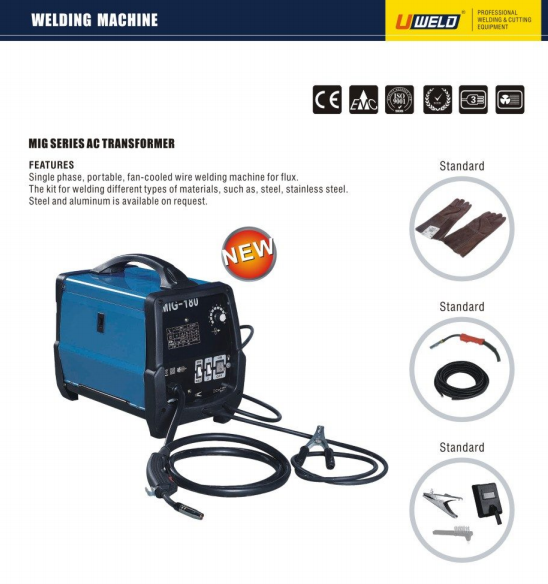 ARC Welding Machine: It is a welder which use electrode. It has the advantages of small size, light weight, high efficiency and energy saving. It is suitable for decoration and outdoor mobile operation. MIG welder: In addition to using tungsten wire instead of Tungsten Electrode in the torch, like TIG welding machine, MIG welding machine can weld almost all metals, and is especially suitable for welding aluminum and aluminum alloys, copper and copper alloys, and stainless steel. MAG welding machine: MAG welding can be carried out by short-circuit transition, injection transition and pulse injection transition. It can obtain stable welding performance and good welding joint, and can be used for welding in various positions. It is especially suitable for welding ferrous metals such as carbon steel, alloy steel and stainless steel. TIG welding machine: The main advantage of the TIG welding method is that it can be welded with a wide range of materials and is suitable for welding of some fine product components. The main areas of application are welding of thin and medium thickness workpieces, and it can be used as weld root welds on thicker sections.